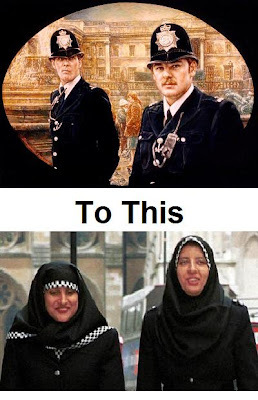 The Islamization of Britain Continues……. – The Tundra Tabloids……. The Islamization of Britain Continues……. What would have been once laughed at in the 40’s, 50’s as being utterly ridiculous as well as being totally impossible, is now a fact of life, and yet the “experts” tell us not to worry and to look at the positive attributes these hooded wonders will contribute to the future of Western society. Complete madness. Previous Post Previous Post Finland: Increase in Immigration and Limited Capacity Should Lead to Rethink of Policies……. Next Post Next Post Mubarak Reads Hamas the Riot Act…….